Here’s a quick podcast on the importance of developing music and audio to support the message and mood of your movie. Here are some tips from some teachers in Monterey, Ca. I have been noodling with Apple's Logic Studio and all I can say is WOW!!!!!!! It is the coolest music production tool I have ever played with. 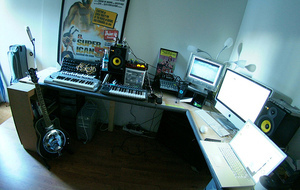 Technically, its considered a comprehensive music studio package. You can be a composer, a producer, a musician, a DJ, or a movie-score dude (or dude-ette)-- Logic Studio has a place in your heart (and creativity). Its not the cheapest application, but since this is the same tool professionals use-- know that you're getting an experience that is synced with what the industry is using. ProTools people, Chill. This Logic Studio interfaces perfectly with your pro tools set up for you final mixing. I see Logic Studio as a production tool will supercool post production features. Let ProTools be a mastering and mixdown application. That's fine. It works. Let Logic Studio make the musical magic. Here are some movies we created for you about the new features of Logic. Enjoy.